First entry in this Arab Travelers series, started here. Takshif is the name given to any man of the Massufah whom the people of the caravan hire to go ahead of them to Iwalatan with letters from them to their friends there, asking them to let houses to them and come four days' journey to meet them with water...Sometimes the takshif perishes in this desert and the people of Iwalatan know nothing of the caravan, and its people or most of them perish too. There are many demons in that desert. If the takshif is alone they play tricks on him and delude him til he loses his way and perishes. There is no road to be seen in the desert and no track, only sand blown about by the wind. You see mountains of sand in one place, then you see they have moved to another. A strange thing I saw is that our guide was blind in one eye and diseased in the other, but he knew the route better than anybody else. The Travels of Ibn Battutah (Picador, 2003), p. 282-23. Demons of the Desert can shift between three forms: a flickering light kind of like a will-o'-wisp, a dust devil, or a tiny wizened creature 4' high. They can only exist in their will-o'-wisp form when there is a single sentient being (aside from other Demons of the Desert) watching. If they are seen by more than one sentient being at a time, they immediately shift from their will-o'-wisp form into a dust devil (first set of stats above) and must remain in that sort of form for 1d6 hours. They can only feed on creatures that they themselves have not directly harmed, so they will use their dust devil forms only for self-defense. 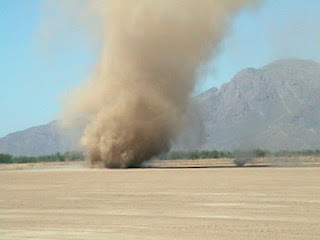 Striking the dust devil form disrupts the twisting column of air at the center, so that you can actually hurt the things. Their third form is reserved for feeding, and it's this creepy wizened little human-like form 4' tall or so. Make it weird and creepy. It's got the lousy stats above (AC 9, d3 claw damage). If a Demon of the Desert is slain, it will shift into this form. Otherwise, it takes d3 rounds for a Demon to shift from one form to another. If discovered, they are cowardly and seek to bargain for their lives. Demons of the Desert do not actually have any treasure of their own, but they are likely aware of that accumulated by their former victims, and any that might be readily visible in nearby ruins.